Expansion pack. Requires the original Neverwinter Nights to Play!!!! 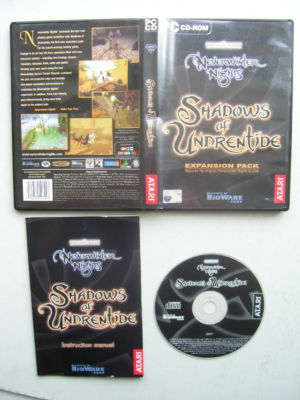 Neverwinter Nights continues the epic role- playing game revolution with Shadows of Undrentide, the first ever expansion pack for the award winning fantasy game. Engage in all new 20 hour adventure filled with new character classes - including five Prestige classes- monsters, weapons, feats, skills and spells!. Develop your own world using the new Neverwinter Aurora Toolset Wizard's; construct the plot, set projectile traps and develop non- playing characters conversations to customise the Neverwinter Nights experience. In addition, three new tilesets, plus enhancements, bring even more deph to the original sets.